"As we continue on the path towards the Smite World Championship we are focused on small adjustments that bring as many possible strategies, items, and gods into the forefront; without disrupting strategies teams are currently employing." "At this time of the year we also are looking towards gods that have been on a downward decline in the last half of this year that can be buffed in a safe way for all players without disrupting the absolute top end of play. 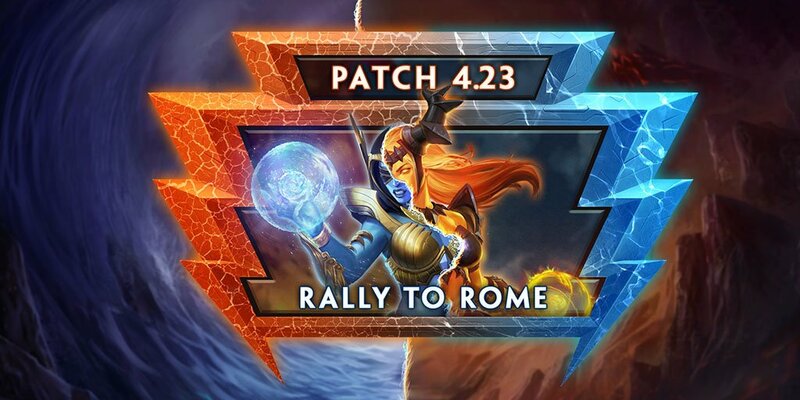 We will keep a close eye moving forward to any issues presented, but 4.24 (the patch SWC will be played on) will only include changes that absolutely need to be made before we close out for the year. 4.25 will be the last patch of the year and will then move into Season 5 early next year." "Jade Emperor's Crown provides a huge spike in defense from Physical Damage dealers early, especially those that rely on scaling values. With it being both good against those building power and those with high base values, we wanted to better define the item's purpose. We are reducing the self protections this item provides, putting the emphasis on the aura effect it brings to the team." "Gladiator's Shield has been a staple for Warriors this season, and after multiple balance adjustments it has been brought much closer in its power level to other items. In this patch we want to bring it down only slightly to ensure diversity in Warrior builds." "Similar to Gladiator's Shield for Warriors, The Executioner has been a core item in most Hunter builds, whether they are working towards Power, Critical Damage, or On-hit effects. We are reducing the Physical Power it provides to nudge it more in line with other options for Hunters." "Devourer's Gauntlets is a powerful item that provides some of the highest cost to stat ratios out there once fully stacked. Historically this item has been on a razor's edge for balance with tweaks quickly pushing it in and out of the core builds of Hunters. Rather than adjust multiple aspects of this item, we are just increasing the cost slightly and pushing back how quickly hunters will be able to begin powering up this item." "Assassins that are more damage oriented have been pushed out in favor of tankier options. While nerfs to items like Titan's Bane helped bring Warrior and Hunter damage into a more fair spot, they did affect Assassins as a side result. Nerfs to items like Gladiator's Shield and Jade Emperor's Crown will also help in this regard, but we want to bring up the overall power of being aggressive with Assassins." "Hydra's Lament is a strong boost to Assassins who can weave basic attacks in between their abilities. Assassins who benefit from this item will get an extra punch that will help them burst down squishy Mages and Hunters more effectively." "Jotunn's Wrath is getting a cost reduction which will help ability based Assassins to become more threatening quicker. While Warriors can make use of this level of Cooldown Reduction the need to sacrifice a tankier item to fit this in will push them in a more offensive or defensive choice; which is a serious tradeoff and creates healthy choices for that class." "Awilix is receiving slight tweaks to the ranges of both Moonlight Charge and Gravity Surge. While listed as a 65 range ability, Moonlight Charge was actually reaching distances of 73. This allowed it to damage and knockup players well outside of its targeter and outside of the range of Gravity Surge. While fixing this we could pull Moonlight Charge back to a range of 65, but this would be a large nerf to a character in a mostly solid spot. Moonlight Charge is instead being reduced from 73 units to 70 units and getting a targeter that properly matches. Gravity Surge is getting a slight increase to allow it to connect with any player that gets knocked up by Moonlight Charge, as well as offsetting the small nerf of reducing the range of Moonlight Charge." "Camazotz has been struggling ever since we adjusted the damage of Vampire Bats and the power bonus from Screech. At the time his dominance warranted the nerfs, but through the recent patches it seems like they were a bit too potent. We are reverting the change made to Screech, allowing Camazotz players to benefit from a more powerful echo buff on all of his abilities." "Discordia has been causing chaos and strife on the Battleground, much to the distaste of the other gods. After watching her initial release, her overall damage and performance is slightly above what we would expect for a character like Discordia. We are reducing the scaling on Strife to lower her late-game burst potential." "Fafnir has a large impact at the highest levels of play, but often struggles to make an impact at other levels of play. High level players are able to use Coerce for game changing plays. Buffing the correct targets at the correct time enables teams to push down objectives at a very quick rate. By increasing the cooldown and reducing the Attack Speed buff teams will have more opportunity to invade a team that is benefiting from Coerce by providing more windows when it is down." "Everyone's favorite noodle is in a pretty rough spot statistically. His abilities have great potential for farm and damage, and he is always useful to a team with his objective secure, so we looked to give him a slight buff that is more directed around feel. Kukulkan's size and flying style of walking makes him feel like he is moving painfully slow, so we are increasing his base movement speed to help him rotate through the conquest map and make him all-around feel better to play." "Medusa has been on the lower end of hunters, having a hard time exerting pressure when it comes to boxing. We are increasing the base damage of Viper Shot to better allow her to box and reward players who can consistently land their Viper Shots." "Ra's performance stats have been continually declining through the second half of Season 4. The god definitely brings unique tools to the table in his abilities to heal his entire team and snipe enemy players from long range. However, his damage output is an at all time low so we are increasing his lowest damaging ability. This ability creates a good amount of risk if Ra wants to use it aggressively, and will give Ra players more flexibility in their play style and give them higher damage potential." "Susano has undergone many changes to his damage potential and mobility. After the last round of adjustments his frustration has gone way down, but so has his overall performance. We are bringing back some of his damage with an increase to Wind Siphon base damage." That's what you call a time investment, right? Yay, code! And quicker patch notes! Ooh you all know what skin I’m buying. Lol no, he's talking about Discordia's mastery skins. We ♣ you too, ld1. The Hel mastery one looks nice too.